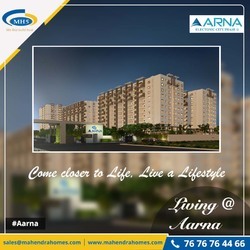 Mahendra Aarna offers a comfortable living in Electronic city Phase 2 Bangalore, with everything you would want or desire, Modern designs and stylish finishes dominates the homes here. Spread over 9.2 acres 744 units offering 2 & 3 BHK in prime Electronics City The apartments ranges from 60L onwards. With 40 Plus amenities available here which includes clubhouses, sporting facilities and an equal number of children activity spaces.